Segre & Schieppati was founded in 1897 when Giuseppe Segre, an enterprising young man of twenty-four, working in a spinning mill in Milan on the Navigli, joined up with his friends Schieppati and Dacono to found a small weaving, dyeing and finishing company in Milan. After the end of the First World War, he remained the sole proprietor along with his sons, Alberto and Amedeo Segre. 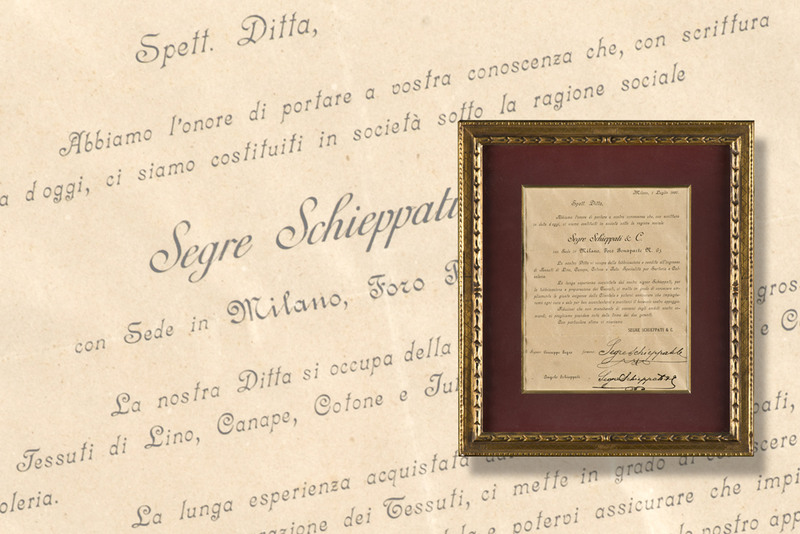 Over the years, the company expanded and became an important point of reference for firms producing shoes and leather goods, which chose Segre & Schieppati fabrics for the production of their own high-range products. After the outbreak of the Second World War, the company still managed to remain active for some time, until it was confiscated by the regime and then closed. At the end of the war, Amedeo Segre, left alone, reopened a small textile activity and, with time, managed to achieve the past success. Italian fashion was becoming the point of reference that the world’s greatest designers turned to for their collections and, in the Eighties, Segre & Schieppati consolidated their position on the textile market, while the management passed to Amedeo’s adopted daughter, Liliana Segre. After more than a century of company history, the baton has passed to the fourth generation with Liliana’s daughter, Federica Belli Paci. Today the company no longer exists, but the trademark, its history, archives and expertise, have been granted under licence to Tessitura Attilio Imperiali, where Federica Belli Paci is a consultant for the development of new creative projects. The best known products, past and present, are untreated fabrics, yarn and piece dyed, made exclusively of natural fabrics, such as the famous Olona Canvas 3212 available in a wide range of colours, untreated Olona Linen and Mixed Linen 0204, both yarn and piece dyed.